Showy Arkansas rock crystal cluster has rainbow foils, devic veils, lots of channel faced crystals, four points with an uncommon 7h face, one with an extremely rare 8h face and one with a nice diamond window as its' 7h face. Cabinet sized, 2x 3-3/4x 1-7/8", it can recline back on its' milk base or sit up. 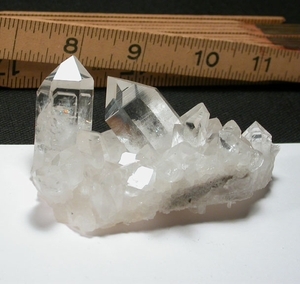 The largest points, 1-1/2 and 2", are two of five intersections with a 2+" doubly- terminated crystal in between them. No damage. Collier Creek Mine, Arkansas.